The University of Pittsburgh at Bradford, located near the Allegheny National Forest in northwestern Pennsylvania, is a regional campus of the University of Pittsburgh. 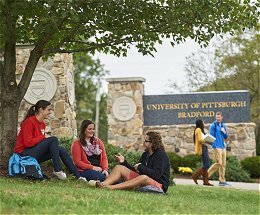 Providing a world-class education, Pitt-Bradford provides students with an intimate campus setting and personalized attention as well as the vast resources of the University of Pittsburgh and the prestigious Pitt degree. 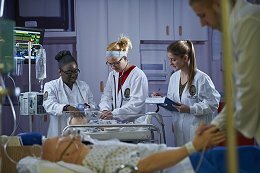 Pitt-Bradford offers 34 baccalaureate and five associate degree programs as well as more than 50 minors, concentrations and pre-professional programs in disciplines ranging from biology and criminal justice to broadcast communications and nursing. Pitt-Bradford has been recognized by The Princeton Review as one of the 150 Best Value Colleges and one of the best colleges in the Northeast for the past 12 consecutive years. Additionally, it was listed as one of the 10 best regional campuses in the United States by TheBestColleges.org, one of the best regional colleges in the North by U.S. News & World Report and a Military Friendly School by G.I. Jobs magazine. Pitt-Bradford offers continuing education opportunities for adult students and representatives of business and industry through the Division of Continuing Education and Regional Development and a wide range of arts and cultural activities through our arts program.